I am from Cambodia and I have been trying my best to plant strawberries from seeds. It seems nor work. I wonder if the weather in cambodia is favourable for planting. Unfortunately, Cambodia is not a great place for growing strawberries. They are temperate plants by nature, and Cambodia isn’t the best place to try to grow them. Sorry! Here are the recommended varieties for Florida. In Florida, you should plant earlier than June. Typically, you want to plant when the weather just starts to warm up. I remember going to Maine as a kid and enjoying the tiny little wild strawberries that carpeted the ground. I never liked strawberries before and I’ve tried ‘storeberries’ since but they aren’t the same. Are there any strawberries that are either small with a huge punch of flavor or have a slimier flavor to those main wilds and not that ‘store taste’ that I can grow in new jersey. Also would I need to plant more plants to compensate for the smaller berry size or do the plants with smaller berries produce more fruit. Yes, there are strawberries that you can get that will give you that punch of flavor. You can either buy the Virginiana or Alpine strawberries. What you probably consumed as a kid were the Virginiana strawberries. They are by far the most flavorful, but they don’t produce many or large berries. You’d need to plant quite a few of them to get the output of the “improved” cultivars that are sold by most nurseries these days. Regardless, good luck with your strawberry endeavors! I have what appears to be strawberry plants growing all down a wood fence. They have very small tasteless fruit and the plants themselves are small. How can I hope to increase the size? If the strawberries have white flowers, they are probably wild strawberries. Those varieties have very tasty fruit, even though they are small. Based on your description, I would venture that those plants have yellow flowers instead. See here: Strawberry Plants with Yellow Flowers. Can you please tell me which variety(es) is/are better suitable for growing on an elevated system. If it is an outdoor system, pick one of the recommended varieties for your state. If it is an indoor or hydroponic system, the day-neutrals work best, like Tribute or Tristar. Good luck! My self Parth from Ahmedabad, Gujarat, India. I love Strawberry & like to grow the same in my greenhouse. I have 4 acre green house. normal temperature range in our region is 16c max in winter and 44c in summers. Will it be possible to grow crop of strawberry in these conditions? If yes, which seeds and type of strawberry verity I should target. With temperatures at 44 degrees C, growing strawberries will be very difficult without installing some sort of climate control. They are temperate plants and much prefer cooler maximum temperatures. I’m sorry! Most non-hybrid strawberry varieties that are used for their edible berries will produce small, highly flavorful and aromatic strawberries. The hybrids are much larger and still sweet, but not nearly as sweet as their pure-blooded relatives. To sum it up, if your plant produces big strawberries, it is likely a hybrid. Good luck! I just bought six varieties online of Alpine strawberry seed (Fragraia vesca). I’m not sure whether I need to chill/freeze the seeds before attempting germination. Also, I’m not sure whether to germinate them right away or wait until spring. I live in the Los Angeles area (Orange County) about 8 miles from the ocean. Commercial strawberries grow great in my area, so once growing, I’m sure the plants will do well. Any advice on timing of germination? How long do seeds need to germinate and become seedlings large enough to transplant? If I plant them now, will they be damaged if they stay in the seedling trays? Many seed suppliers will precondition their seeds so that they will germinate better. To precondition yours, if they haven’t been already, just but them in the freezer for a month. Afterwards, they should germinate much more rapidly than otherwise, but many varieties will still germinate without the chill time. Unconditioned seeds can take up to a month to germinate, while seeds with a chill time of a month will often germinate within two weeks (but can germinate in as little as four or five days). Planting now should not be a problem for your seed trays. Strawberry seedlings are tiny when they first germinate and do take a while to grow. If they grow too rapidly, they can be transplanted into a bigger container. Good luck! I’ve been searching for what seems like ages for a strawberry variety that would nourish in the middle eastern conditions (hot,dry) under plastic houses (green houses), and i cant seem to find what am looking for, please help me, am interested in the best yielding variety under such conditions. Thanks for your help, awesome website. Unfortunately, strawberry plants are temperate by nature. That means that the very hot climates just aren’t suitable for growing strawberries. You might want to try Chandler or other varieties that do better in warmer climates, but hot climates will make it difficult to grow any of them. Good luck! The biggest strawberries are hybrids and do not grow true from seed. The heirloom strawberries will grow true from seed, but they are usually smaller, albeit with great flavor and aroma. If you want huge strawberries, you’d likely need to buy strawberry plants. If smaller and sweeter is ok, you can go here: Buy Strawberry Seeds. Good luck! Strawberry plants don’t do very well in tropical climates. They are temperate-loving, and they do best with cooler weather than you have at your locale. If you are going to plant strawberries, I’d recommend having some sort of climate-controlled environment for them. Good luck! I have a hydroponic system by Tower Garden. What would be the best strawberry to grow in my tower? The best strawberry varieties for use in hydroponic or aeroponic systems are the day-neutral varieties. Two of the best day-neutral strawberry varieties are Tribute and Tristar. Good luck! I planted strawberries from packaged seeds last year and have kept them indoors. Many sprouted but only have grown 1-2 inches tall. Strawberry seedlings are notoriously slow-growing when sprouted from seeds and kept indoors. To get more rapid growth, harden them off slowly as they are delicate, and get them outside into a more growth-conducive area. We want to grow strawberry in Russia from strawberry seeds. We plan to plant all the three types of seeds _ early, medium and late ripening ones. We need the seeds that give the most crop. We also want our crop to be the most delicious and the biggest. By the way, the climate in the region where we want to grow strawberry, will be nice and sunny from April 15, about 20 C, and we can actually plant the seeds at that time. In the directory of Strawberry Seeds for Sale, there are plenty of options and wide choice, but we still don’t know which one to choose, and we can’t make a right decision. Please, could you provide us some advise on this? Which seeds can be the best option for us? Unfortunately, the seeds that are available will not produce the early, mid, and late season June-bearing strawberry plants. All of those plants are the result of cross-breeding. They are all hybrids. Consequently, they will not grow true from seed. I would recommend trying to get bare-root strawberry plants shipped to you in order to accomplish what you want to do. Seeds won’t work in your case for your goals. Good luck with your endeavors! The strawberry plants I germinated have done very poorly, I didnt know what the problem was until 2 weeks ago when I realised that the soil was of very bad quality, I changed the soil and the changes are already visible, but the problem is the winter here is over and Im just 2 monthes away from the hot and humid Sharjahi climate, and I dont believe strawberry plants like that kind of weather. So the question is, should my plants start doing poorly due to heat and air humidity, what can I do to help them survive through the summer? I’m sorry to hear that your strawberry seedlings aren’t doing very well, but I’m glad you fixed your soil problem. If you have two months, you might be able to get them to grow and establish themselves a bit more before the hot weather hits. You are right about strawberry plants not liking hot and humid weather (for the most part). They are native to temperate regions and many varieties are susceptible to fungus infections that tend to be ubiquitous in very humid or wet conditions. If it gets too hot or humid, you will need to try and control the environmental conditions of your strawberry plants. You can try to cover them and create air flow with fans or move them into climate-controlled greenhouses. Good luck! I saw a comment from someone from Israel stating that it is illegal to ship seeds to that country. Within the last month I have shipped several shipments to Israel with no reports of problems. To date, I have not had any problems with any of the numerous countries where I have shipped seeds. Hello! I have a question about strawberry seeds. If you are using the sieve method for getting the strawberry seeds, do you have to take the seed out of the “Fruit” that is holding it after they have been separated from the pulpy part? Also, is there a way to promote the growth of runners on a Quinalt Everbearing Strawberries? I heard they do not produce runners if any at all. Would a greenhouse be a good environment to grow plants to protect it from the elements and birds? Thank you for creating this website. It is very informative, and I love to learn about growing my favorite fruit. You do not have to separate the small amount of residual pulp, if that is what you are mentioning. Drying them will be sufficient with that miniscule amount of pulpy material left on the seeds. Don’t let them sit long before drying them, however, as moldy seeds are not desirable. 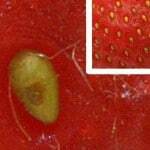 If you are referring to the technically correct fact that the strawberry seed is actually an “achene” with the “seed” inside the fruit body (not the red fleshy accessory tissue), then most certainly you do not have to try to separate it. That would be tough work! As for runner production, the genetics of the strawberry plant dictates how many runners are produced (along with the environmental conditions). For varieties that do not produce any or many runners, it is difficult to count on any significant runner production, even if grown under optimal conditions. Greenhouses do protect from birds and bugs, to some degree, and can keep your plants safe from becoming waterlogged if you live in a climate with heavy rainfall. As for the site, you are welcome! Hello, I bought a strawberry plant two weeks ago & the plant was growing well but today when I checked the plant, I noticed that the plant is wilting & its leaf edges are turning brown. I then changed the soil & i found that the old soil is sticking to each other. Is there any way to revive my plant? I use LED grow lights to grow my plant. I live in a tropical area. There are numerous possible causes, so it is hard to pinpoint exactly what is causing your plant’s problems. It could be nitrogen deficiency or infestation with one of the many strawberry diseases or pests. Or, it could be that your grow light isn’t close enough (or is too close!). My guess, however, would be that the soil was kept too moist and you either have a fungal infection that will kill your plant or a problem with root rot. Tropical conditions are not generally good for strawberry plants, which are temperate. Hello, I live in Israel and I want to grow Alpine strawberries, I can grow them in hydroponics system? You can grow Alpine strawberries in hydroponic systems, but they usually don’t do quite as well as they would under normal growing conditions. I am not familiar with the export/import requirements for Israel, but this post might be of assistance to you: Shipping Strawberries. I successfully germinated strawberry seeds from store-bought strawberries, I plucked the seeds off the strawberries, cleaned them and stored them in the freezer for 2-3 weeks then planted them, the sprouts are so tiny they require a magnifying glass! it has been a month since they germinated and some of them died (probably heat stress, I live in UAE and the winter is just starting here) but one plant seems to be doing very well and it has 4 leaves so far, I put my plants on the windowsill in the morning where they get 3-4 hours of direct sunlight daily and when the sun sets off the window I take them to my balcony where they recieve plenty of indirect sun, Im also using an aluminum sheet to maximize the sunlight as I havent found any grow lights yet. I have no idea what the variety of my strawberry is but I know that I got it from a driscoll strawberry, my questions are, approximately how long is it going to take my small strawberry plant to produce runners? Will it produce strawberries? Can it produce tasty berries with just 3-4 hours of sun? Strawberry seedlings are definitely tiny when they first sprout. It will take your plant some time to produce runners. Likely, it will be next growing season before runners are sent forth. With only 3-4 hours of sun, it may produce a few strawberries, but they will likely be small and have less-than-optimal taste. Plus, virtually all of the store-bought strawberries are hybrids, so there is no telling what the berry characteristics will be on your seed-sprouted plant, but they likely won’t be as big or tasty as the ones you purchased since those have been selectively bred for years to arrive at their current state. But, I applaud your efforts in growing strawberries from seed, and good luck! please direct me where to order strawberry seeds of red gauntlet, tioga, cambridge or albion? All of the varieties you mentioned are hybrids and will not grow true from seed. So, no reputable dealer will sell seeds harvested from those varieties. However, there are multiple retailers who sell the bare-root plants in each of those varieties. You can shop for each of those varieties by clicking on the respective links: Red Gauntlet, Tioga, Albion, Cambridge Favourite, Cambridge Prizewinner, Cambridge Vigour. No problem; that’s the reason it is here! I live in south ohio what is the best type of strawberry seeds to plant in my area? According to the Ohio State University Extension, the best strawberry varieties for growing in Ohio are (click the links to price shop or order online from retailers): Delite, Earliglow, Guardian, Kent, Lateglow, Lester, Midway, Redchief, Surecrop, Tribute, and Tristar. However, all of these varieties are hybrids, and, as such, will not grow true from seed. It is recommended to buy plants or crowns instead of trying to grow your strawberries from seed to ensure you get what you want! What happens if I plant directly the fruit in the ground? Will the seeds, germinate? If you dig a hole, put a strawberry in it, and cover it up, you most likely won’t ever see strawberry plants grow from the strawberry. In nature, the strawberries are eaten by birds and other critters, and the seeds are subsequently passed. This usually occurs during the spring or summer. As the seeds plummet to the ground in their, ahem, new environment, they splat and get covered by a thin layer of organic matter/dirt over the course of the rest of summer, fall, and winter. Out of this thin layer of soil, following months of cold, the seeds will germinate with the first warm weather of spring. The seedlings are tiny. If they are below the surface more than just a bit, they won’t be able to make their way to the light (which helps some varieties germinate as well). So, if you are trying to grow a strawberry plant from a strawberry, the best option is to thinly slice the strawberry, dry it, and then lightly cover it where you would like it to sprout outdoors prior to the cold winter temperatures. This can be a rewarding experience IF you can keep the bugs and the birds from finding, stealing, or destroying your buried strawberry slices. It is much easier to just buy strawberry plants from a nursery or supplier. Strawberry Plants .org does not directly sell or ship strawberry seeds. We do, however, have a directory of suppliers who do. See: Strawberry Seeds for Sale. Some of the suppliers there may ship to South Africa. For more information on what is involved with shipping strawberry plants or strawberry seeds internationally, see this: Shipping Strawberry Plants.